We have recently bought a new home in the south west highlands. There is an area of around 600 square metres which we would like to lay to low maintenance flowering \\\'grass\\\' and plant small trees. The idea is to brushcut once or twice a year. We don\\\'t want it to look unkempt or grow too long in between cuts but equally well we want it to look natural and attract insects. This is a fairly exposed site. The soil is good, well drained and slightly acidic. Can you recommend a good quality grass seed mix which is not too expensive that would work for us? Find a seed source close to you. It will have adapted to grow well in your area. In the US, native plant nurseries sell bulk, low maintenance seed. I believe it is mostly tall fescue. Brand names are Eco-Lawn or Eco-Grass. 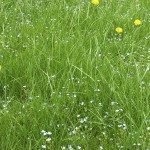 (https://www.prairiemoon.com/eco-grass-low-maintenance-lawn-alternative.html). Other popular alternatives to grass are sedges, heaths and heathers. The last 2 need acidic soil.